I was in Moose Jaw, Saskatchewan recently and I couldn't help but notice Parrish & Heimbecker's massive elevator in downtown Moose Jaw. I like grain elevators, but this massive concrete structure is not exactly a thing of beauty! P&H is celebrating its 101st year of operation as a private, family-owned business. They have about 40 locations featuring elevators, sidings, and terminals. What really caught my eye was P&H's switcher, #8454. This is a loco with a story! It was built by MLW as an S-3 as CN 8454 in January 1952. It was eventually sold to Manitoba Paper in April 1963, then it went to Pine Falls Paper, then to Railside Locomotive Services. RLS leased it to the Prairie Dog Central when the steam engine died. In August 2005 it went to P&H. Pretty, isn't it? There are lots of photos of this unit on the web. I've taken the plunge. I cashed in some Air Miles and now I'm waiting for this baby to arrive. Another blast from the past... CN RSC-14 1771 in Halifax, Nova Scotia on May 30, 1976. Walter Matuch took this lovely slide. I'm not really sure where it was shot in Halifax. Douglas Courtney took this nice shot of grubby CN RSC-14 1761 in Halifax on May 29, 1991. By the sand tower in the background, this was taken in Fairview Yard. Train 16 – May 27, 2010 - Due to operational issues, train 16 will terminate in New Carlisle for the next 2 weeks. VIA will provide bus service between New Carlisle and Gaspé. This message will be updated once normal operations have resumed. Train 17 - May 27, 2010 - Due to operational issues, VIA will provide bus service between Gaspé and New Carlisle for the next two weeks. Regular train service will be provided from New Carlisle to Montréal. This message will be updated once normal operations have resumed. The CN TEST train ran up the Gaspé line recently, and likely created so many slow orders that it is impossible to get the Chaleur to Gaspé and back in time. In other news, the diner will be back on the Chaleur starting June 6. Check the menu out. Of course VIA is still calling the Chaleur the "Montréal-Gaspé train". Maybe they should call it the "Montréal-New Carlisle train, occasionally traveling to Gaspé". I shot the Canadian for the first time in a while. As you can see, it has grown to a respectable size. Right after VIA passed, the BNSF transfer train pushed out of their yard onto the CN main line to proceed to Fort Rouge. As you can see, the ditch lights were not on. This is a sad sight. W.A. Gleason caught this scene on slide on August 12, 1997 in Moncton. A dead line of MLW M420 units. I count 6 or 7 units, all apparently missing their prime movers. The closest ones were CN 3527, 3520 and 3525. My 1997 Trackside Guide says those three units were retired in 1996. CN's M-420s were built by MLW between 1973 and 1976. CN had 80 of them at one point. The units were originally numbered in the 2500 series, but in 1986-7 their sand and fuel capacity were reduced to bring their weight down by 12,000 lbs. and they were renumbered to the 3500 series. In late 1994 some were renumbered back to the 2500 series and the reductions were reversed. What is a train? It seems like a simple question, but in the context of the Canadian Rail Operating Rules, it is a little more complicated than you might think. (b) is a track unit when so designated. You also need the definitions of ENGINE, TRACK UNIT, and TIBS. ENGINE: A locomotive(s) operated from a single control or a cab control car, used in train, transfer or yard service. TRACK UNIT (TU): A vehicle or machine capable of on-track operation utilized for track inspection, track work and other railway activities when on a track. TRAIN INFORMATION BRAKING SYSTEM (TIBS): A system with rear and front of train radio communication components capable of: 1. monitoring and displaying brake pipe pressure on the rear car; 2. calculating and displaying distance measurement;3. initiating an emergency brake application at the rear of the train from the head end; and will be equipped with a red light and/or red reflectorized plaque at the rear of the train. First off, a train has to have an engine or a track unit. A stand of cars by themselves is not a train. Note the requirement that the engine has to be intended to operate at speeds greater than 15 MPH. A "yard transfer" can operate on main track but not exceeding 15 MPH. TRANSFER: An engine with or without cars operating on main track at speeds not exceeding 15 MPH and need not be TIBS equipped. OK, so a train has to have an engine intended to operate at greater than 15 MPH. It can have: (i) no cars; (ii) cars with a TIBS or loco on the end; (iii) cars and occupied caboose; or (iv) passenger cars. The CROR lump all types into a movement. MOVEMENT(S): The term used in these rules to indicate that the rule is applicable to trains, transfers or engines in yard service. It matters because some rules apply to movements and some just apply to trains. For example, I have always wondered why BNSF never uses the ditch lights when going between their yard in Winnipeg and CN's Fort Rouge yard. The answer is there. The BNSF job is a transfer, not a train, so it is not required to use ditch lights. Rule 17 says it must use headlights, and that is why you will see the single headlight on but not the ditch lights. In most cases, the CROR uses the language "train or transfer" to cover both types, but you need a sharp eye to note the exceptions. I happened to see the Central Manitoba Railway (CEMR) switching at Oak Bluff just south of Winnipeg on the Carman subdivision. A pair of ex CN GP9s, CEMR 4000 and 4002, were shunting a few cars at the lumber yard, while the rest of their train waited just north of the Perimeter Highway. There's a lumber dealer there that receives centerbeam flatcars, and a fertilizer? dealer that gets hopper cars. Sometimes the siding is used for storage. BNSF 1685, long-time resident of Winnipeg, will be returning to her old stomping grounds in July 2010. BNSF informed the Prairie Dog Central tourist railway that they will be donating the retired GP9 engine. BNSF 1685 was built for the Midland Railway of Manitoba as #2, and served the city for many years in that capacity, and later as BNSF 1685 before being retired. This is great news for the PDC and for Winnipeg. The orange unit was a familiar sight in Winnipeg and it is good that it is coming home. The Shogomoc Historical Railway Site opens for the season on Tuesday, June 1. Come see the restored 1914 CPR railway station, their railway cars, gift shop, and park. I visited the site in August 2007. A lot has been done since then! This is a followup to my entry about OCS clearances. I want to talk about proceed vs. work clearances, and rule 104. The original, sample clearance was: "Item 1. OCS clearance #1234 to train CN 532, engine 2238. Item 5, proceed from Sparks to Andrews. Item 7, protect against Foreman Smith between Sparks and Andrews. Item 12, complete at 1225 RTC JBM." One point I made was that this is a "proceed" clearance, meaning the train* can only go in the direction indicated and cannot back up without getting a new clearance. A "work" clearance allows unlimited backup moves. Why wouldn't the RTC issue work clearances for every train? Simply put, a work clearance gives the entire section of track to the train until the train crew releases it. This is fine if that train is the only one due to run on that section of track, but if someone else (another train, a maintainer, etc.) wants to use that section of track, they have to get permission from the first train. Using a proceed clearance means the track behind the train is released as the train moves. If another train wants to follow the first train, all the RTC has to do is call the first train, find where their tail end is, then give a clearance to the second train up to the current position of the first train. As the second train approaches the end of its authority, it can call the RTC and repeat the whole process. This keeps more trains moving. If you read the OCS clearance form, you may have noticed items 8 and 9. I'm not sure why it says 104(b), because the CROR shows it as rule 104(i). It starts with "A main track switch may be left in the reverse position when;..." and has a list of conditions where it may be left in a reverse position. Imagine you are the crew of a long, heavy freight train, say a loaded ore train leaving the Nepisiguit Subdivision near Bathurst, NB. You approach the switch at the east leg of the wye at Nepisiguit Junction and stop. The conductor dismounts and lines and locks the switch in the reverse position, allowing your train to proceed onto the mainline. Without this rule, the conductor would have to wait until the train passed and stopped on the main line, then line and lock the switch in the normal position and walk the length of the train to the head end. Remember, they couldn't back the train up to pick up the conductor because they wouldn't have a clearance past the switch's mileage. To save time, they are permitted to leave the switch in the reverse position. The next train to be given authority to pass that switch will have a note in their clearance that the switch may be reversed. This was very common at Nepisiguit Junction, and likely still is. The empty train coming onto the Nepisiguit sub would put the switch in the reverse position and leave it reversed while the train went to Brunswick Mines, loaded up, and came back to the mainline. Because it was still reversed (assuming no other train went by in the meantime), the loaded train could roll right through without stopping. The next mainline train would stop and reline the switch before proceeding. VIA 15 at Nepisiguit Junction, stopping to reline the switch. The CROR are full of rules like this, used to protect the trains and also to help traffic flow easily and safely. "Item 1. OCS clearance #1234 to train CN 532, engine 2238. Item 5, proceed from Sparks to Andrews. Item 7, protect against Foreman Smith between Sparks and Andrews. Item 12, complete at 1225 RTC JBM." First of all, OCS stands for Occupancy Control System in Canada. This is what is known as "dark territory" where there are no signals to govern train movement. All movements must be authorized by the dispatcher / RTC. This OCS clearance is the authorization for train 532 to occupy track on the Letellier subdivision. You can read about OCS in the Canadian Railway Operating Rules, specifically the 300 series of rules. In order to interpret the OCS clearance, you need to have a copy of CN's OCS clearance form (to know what the items mean) and a copy of the timetable for the appropriate subdivision (to know where the locations are). 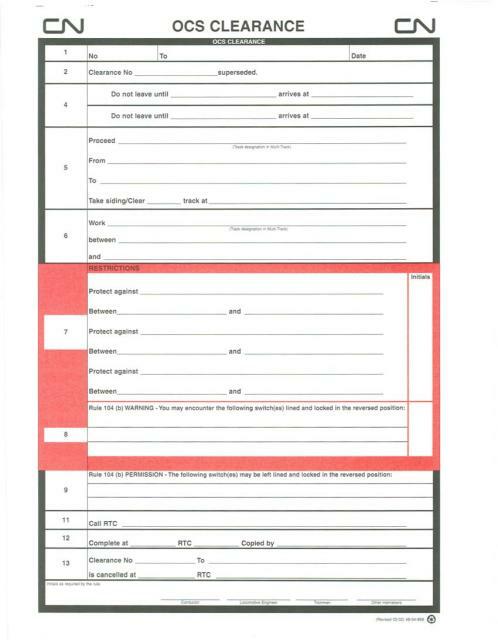 Here's a blank OCS clearance form. Here is the CN Letellier subdivision, from the August 1 2009 timetable. OK, now we'll go through each item. "Item 1. OCS clearance #1234 to train CN 532, engine 2238." This is pretty straightforward. It identifies the clearance number for reference, and most importantly identifies what movement will own the clearance. "Item 5, proceed from Sparks to Andrews." There are three key items here. The two obvious ones are the bounds of authority, the timetable locations Sparks (mile 3.0) and Andrews (mile 36.2). There are no sidings listed on the Letellier subdivision, so the limits are the station boards at those two locations. If there were sidings, the limits would be just outside the fouling limits of the sidings (CROR rule 304.1). The third key item is the word "proceed". This means that the train must go in the direction specified, and cannot back up without getting a new clearance. There are very limited exceptions, specified in CROR rule 308.1. The RTC could have said "Item 6, work between Sparks and Andrews" instead and that would authorize as many backup moves as the train crew wished. "Item 7, protect against Foreman Smith between Sparks and Andrews." This tells the train crew that Foreman Smith is somewhere out there, and it is the train crew's responsibility to contact Foreman Smith and get permission to pass through. Foreman Smith may not even be aware of the train until s/he gets contacted. "Item 12, complete at 1225 RTC JBM." This shows the OCS clearance is complete and there are no further items. Once the crew writes all of this down, they repeat it back to the RTC to confirm that they received it correctly. The OCS clearance does not go into effect until the train crew repeats the entire clearance including the last line. That's enough for now. There are a lot of interesting variations possible but this gives the gist of the OCS clearance system. EDIT: Added timetable page for CN Letellier subdivision. Canadian Pacific Railway derailed a train near Carstairs, Alberta last Wednesday, May 12. Here are some photos. (news: CTV Calgary, Global TV, CBC) The same photos are also in a Flickr gallery. CP 9771 and CEFX 1043 were the power at the head end of the container train. That followed CP's derailment last Tuesday outside Smiths Falls, Ontario. Bad week for the CPR! Check this video out from England. 3. Guy who said "yoo hoo" to warn of the oncoming train? Nobody really comes off too well in this video. Keep safe out there. Your safety is worth more than "getting the shot". I miss those NBEC MLW / Alco units. Here's train 591 (the Dalhousie turn) with NBEC 1813 and 1857, in the evening of October 6, 2003. A little further south, NBEC 1845 brought a short woodchip train from the Nepisiguit Subdivision into Bathurst on May 28, 2007. One more... with a different Alco, a C-424. NBEC 4230 and RS-18 NBEC 1840 were en route from the port in Miramichi to the yard on September 20, 2002. This was "back in the day" when the C-424s were on yard duty in Miramichi. Here's a sad little video someone took, of a dead line of ex-NBEC and CFMG locomotives in Chicago last year. The units shown are RS-18s NBEC 1813, 1851, 1857; C-424 NBEC 4235; and SD40s NBEC 6905 and CFMG 6906, 6907, 6909 and 6910. It's hard to believe that I have been chasing trains for more than 10 years. My first recorded train sighting was on May 13, 1999 when I saw NBEC 1857 shunting boxcars in Dalhousie. I was captivated! At the time I was shooting film, of course. I had a Minolta Maxxum 5000i SLR and I happened to have it with me to shoot scenery and wildlife... not to shoot trains. I soon got into the habit of bringing my camera anytime I thought I might be near train tracks. Since then I have moved from the Minolta to a Sony DCR-TRV25 video camera (that I still use), to a Fuji point-and-shoot digital (still works), to the Canon S3 I use now. The picture quality has improved each time, partly due to the camera quality and partly due to my increasing skill at photography. However, I don't mean to imply that I am an expert photographer by any means! I still have a lot to learn, but I think my techniques are much better now than they were when I started shooting trains. After 11 years I have not lost my interest in trains. My wife might disagree with me, but I hope I never do lose that interest. Thanks for being along for the ride. I was wandering around Phoenix one night when I came across this sign. I'm not a huge fan of transit equipment, but hey, it rides on rails so I took a closer look. Imagine my surprise when I saw this car deep in Arizona. This is ex-Toronto Transit Commission (TTC) car 4607. It turns out that Valley Metro, the transit authority for the Phoenix area, has a transit terminal in that area. As part of the terminal, they have a little fenced-off area as an outdoor display of older transit vehicles. As it happens, there is a Phoenix Trolley Museum a few blocks north of this location. When I was waiting for CN 532 to arrive on Friday, I noticed a few flatcars up the line from where I parked. I walked up and found this company, CG Power Systems Canada makes distribution and power transformers. Some of those are very large, and many of them would ship by rail. QTTX 130532 is a depressed-center flatcar specially designed for shipping loads like these. Interesting as that was, there was another, even larger flatcar there. This car is owned by Kasgro Rail Lines, and has a load limit of 200,000 lbs. More information on KRL 300301. This company has two spur tracks at around mile 0.6 on the Letellier Subdivision, just south of Fort Rouge. I had no idea there were any online industries on the Letellier sub inside Winnipeg, other than the ones around Chevrier. You learn something new every day! I would have thought everyone was shooting digital now, but apparently some people are still shooting slides. Huh. I was in Phoenix, Arizona back in mid April, for work. I was staying downtown and I didn't have a rental car. On two evenings I took a walk to the nearby Union Pacific yard to try to get some shots with my old Fuji digital camera. There are very few good locations to shoot the yard. Everywhere you look, you see these signs. Of course, I respected the signs and did not go past them. Here are a few shots I did manage to get. You can shoot the east end of the yard from an overpass, but if you shoot in the evening like I did, the sun is in your eyes. That's the downtown in the background, with Chase Field, home of the Arizona Diamondbacks, to the left. This is a view of the west end of the yard, on an overpass next to Chase Field. In the background to the right, you can see a long line of stored locomotives. I estimated there were over 30 stored there. That night, I wandered around a bit, and on my return I was surprised to see a westbound train leaving the yard. I grabbed this quick shot through the fence on the overpass. UP 1527 and ex-Cotton Belt unit UP 7275 headed up the train. I hope you enjoyed my brief glimpse of the Union Pacific yard in Phoenix, Arizona. Maybe next time I'm down there, I'll get a chance to take a few more photos! It's National Train Day today! What are you doing for this day? 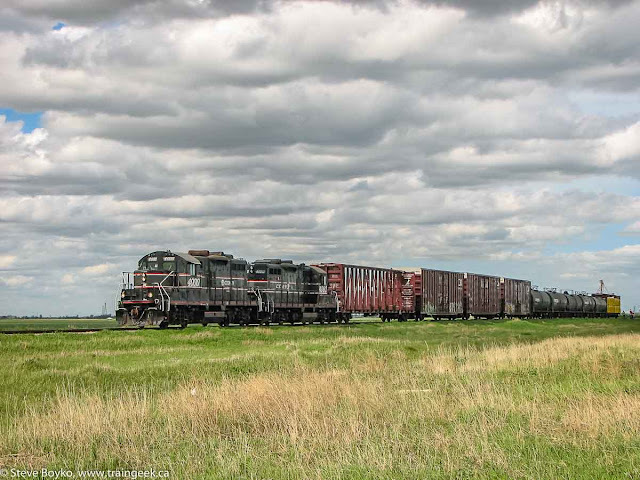 I heard CN train 532 was getting ready to depart the Fort Rouge yard around noon today, to head south on the Letellier Subdivision to the U.S. border. I went to just north of the McGillivray Boulevard - Pembina Highway junction to get the shot. I saw the tree there and thought I'd get a bit artistic. What do you think? The train itself had CN 2238 and 5646 for power. I didn't count the cars but there must be over 100. I was driving south on the Perimeter last night, after a Prairie Dog Central meeting, and I saw an eastbound train on the CN mainline as I approached Wilkes Avenue. I saw that it had four engines on it, two conventional CN engines followed by a blue ex-BC Rail engine. The fourth engine, though, was something unusual, in an orange-brown livery. Time to chase! I took the exit and headed east on Wilkes Avenue. Before too long, I was ahead of the train and I could stop to grab a quick video in the rain and approaching darkness. The mystery engine is CN 1700, a GE B39-8E that BC Rail acquired in 2000. It has special orange-brown livery for use on the Whistler Northwind, a service that ended in 2002 after only two years of operation. CN 1700 still wears the same colours, albeit somewhat faded, and it has the Whistler Northwind logo on the side. The following is a very nice video by boots176 of the same unit, back in 2002 when it was still pulling the Whistler Northwind. Saturday is National Train Day (in the USA). Amtrak is running a number of equipment displays across the U.S. If you're in the U.S., why not attend an event? There's a new railway idea in Canada... the Trans-Quebec Express. The idea is to have a railway run from Gaspe to Nunavut through Quebec... over 9,000 km of track. Of course, it really isn't a new idea. The author of the site says he has been dreaming of this for over ten years. There is an article in Nunatsiaq Online stating that a petition with over 4,000 signatures was presented in Quebec's "National" Assembly. I don't think I need to say any more about this idea. Good luck! The Canadian Rail Operating Rules are the set of operating rules used for all Canadian railroads. These rules provide the basis for all railway operations in Canada, and include such items as track clearances, CTC, switches, signals, engine bells, and on and on. The May 2008 version is 107 pages long. I and a number of other Prairie Dog Central volunteers completed our rules training today, after two full days of study and testing. I plan to volunteer a fair bit at the PDC this year, after a few stints last year, and this rules card allows me to begin my training on the engines. The Daily Gleaner is reporting that the Historic Sites and Monuments Board of Canada has given its approval in principle for the refurbishment of the train station in Fredericton. The station will have the main section refurbished, and the baggage section on the rear will be demolished. The Fredericton Railway Company (owned by J.D. Irving) must still submit detailed plans for approval. Things change on the Internet. Yet, you can often go "back in time" to see what used to be around. The good folks at archive.org maintain a history of many web sites. Have a look at my web site 9 years ago. It looks a lot simpler and has a lot less content.. and of course it was four years before I started blogging. Time flies!